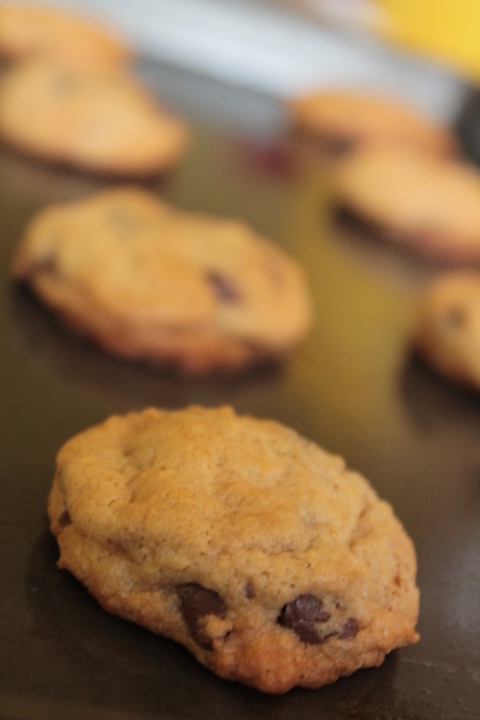 We love chocolate chip cookies around here. However, I’m not always in the mood to mix up a full batch of cookies. 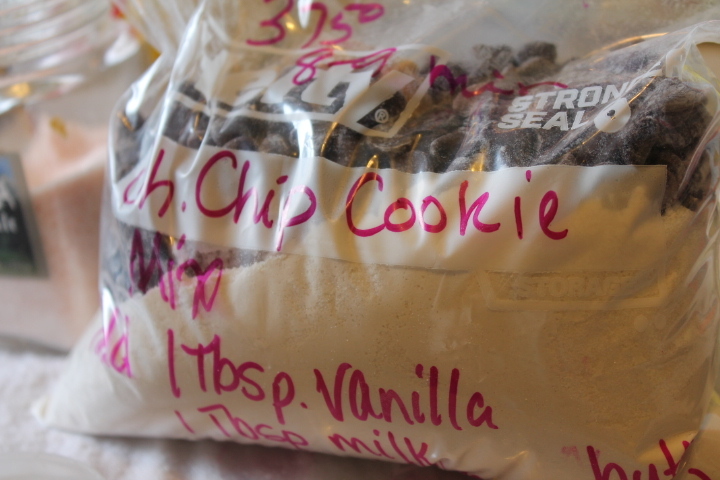 Make ahead chocolate chip cookie mix to the rescue. The dry ingredients are already mixed up so all you need to do is add the wet ingredients and mix. 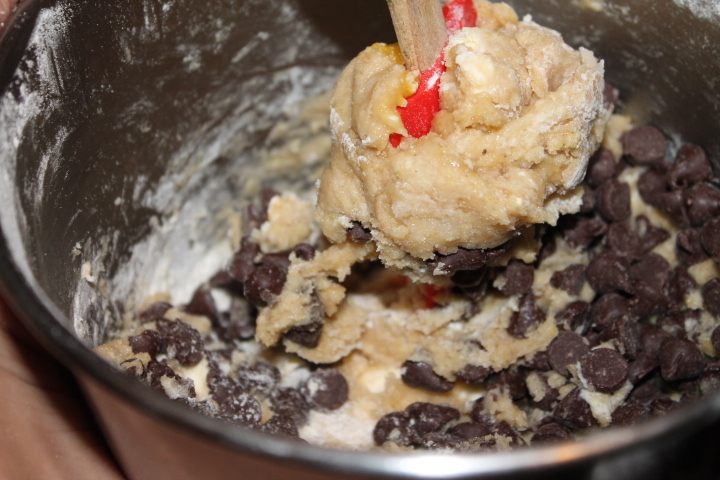 Hint: Use an electric mixer because it’s harder to mix by hand. It’s doable just harder to get all the ingredients mixed together. These can be stored for 3 months in an airtight container. I used zippered storage bags. Mix all of the ingredients together in an airtight container. Place all of the ingredients in a mixing bowl. Mix together until well incorporated. 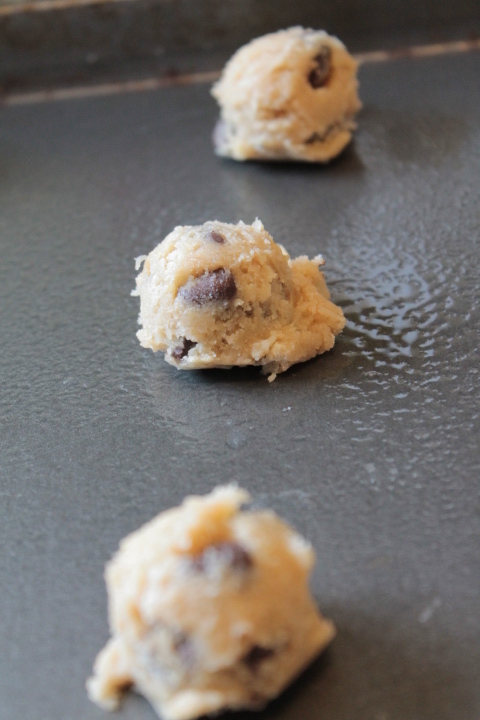 Drop cookie dough by tablespoons onto a baking sheet. Allow to cool for at least 2 minutes before removing it from the tray. Enjoy with a glass of milk, cup of tea, or a cup of coffee. I got at least 36 out of my dough but the original recipe got 18 out of her mix. According to my stats counter, these are the top 10 recipes that were clicked on. Taco Crescent Bake was #1 – It was published in February of 2011. Sloppy Joe Pizza was #2 – It was also published in February of 2011. Watermelon Cookies was #3. These continue to be my kids and students favorite cookies. It was published in July of 2010. Makes It Own Crust Apple Pie was #4. It was published in November of 2011. Baked Spaghetti was #5. It was published in January of 2012. Homemade hamburger helper was #6. It was published in October 2010. Charleston Cheese Dip was #7. It was published in January 2012. Ranch Chicken Legs was #8. It was published in March 2011. Peanut Butter Blossoms was #9. It was published in October 2010. Green beans, potatoes, and ham was #10. It was published in April of 2012. Here’s to a successful 2013! I went to my stats’ summary page to find the recipes that get the most clicks. This is the top post of 2012. I’ve previously mentioned how I like Joanna Fluke’s Hannah Swenson books. I’m rereading some of the books in the series. As I was reading Key Lime Murder, she included this recipe. I was instantly intrigued. I’ve made other oatmeal cookies that included chocolate chips and M&M’s. This year I wanted something simple. This cookie fit the bill!!! Melt the butter in a microwave safe bowl on high for 1 1/2 minutes. Let the butter cool to room temperature. Mix in the white sugar. Add the baking soda, flour, and oatmeal. Stir thoroughly. In a small bowl, beat the egg yolk with a fork until it’s thoroughly mixed. Add the yolk to the bowl and stir until it’s incorporated. Grease or spray with cooking spray cookie sheet. Make small balls of dough and place them on the cookie sheet, 12 to a sheet. Press them down with a fork in a crisscross pattern. Let cool for 1 or 2 minutes before transferring them to a wire rack. Every year I bake and create Christmas goodies. My grandma used to do the same thing and then share with family and friends. I have her bench she used to pile the containers onto and the Kitchen aid mixer she used to whip up the batches of delicious cookies. Once I was an adult living in a place where I could bake, I started the tradition. 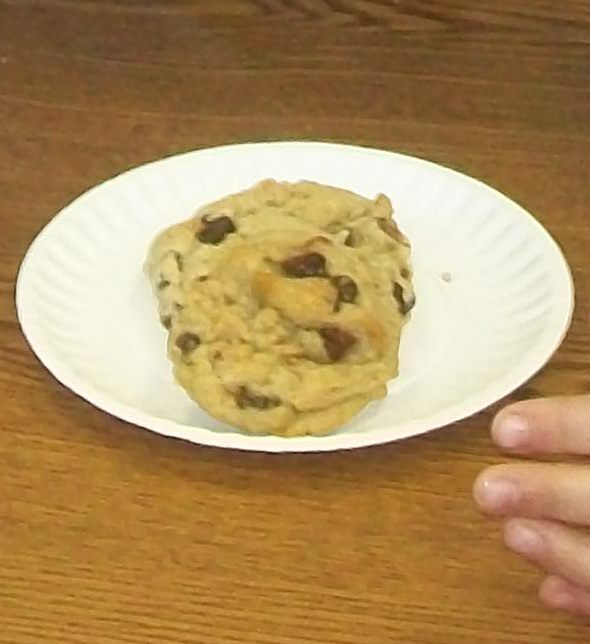 I have my tied and true cookies I bake every year and then I try new recipes. Four years ago, I lost my grandma on Christmas Eve. For five days before her death, my family sat by her bedside. When I couldn’t be there, I baked and created in my kitchen as a way to keep my mind off of losing her. I then brought the goodies with me when I was at the nursing home. The family shared the treats. It was a wonderful way to honor her. On Christmas Eve of 2008, after everyone had left the nursing home when God welcomed her home. I was at the Christmas Eve service when I got the call that she had died. I remember breaking down into tears. Grandma so loved Christmas that she took her last breath the night before Jesus’ birth. Another tradition we hold dear is baking a cake, cupcakes, or brownies to celebrate Jesus’ birth. We sing “Happy Birthday” to him as a way to remember him. The tradition started when the Imaginative One was a baby and has continued ever since. However I was introduced to the concept almost 20 years ago. I had worked at McDonald’s as a college student and was trained to host birthday parties. One party I hosted was a birthday party for Jesus. It was held during the holiday season and stuck with me. 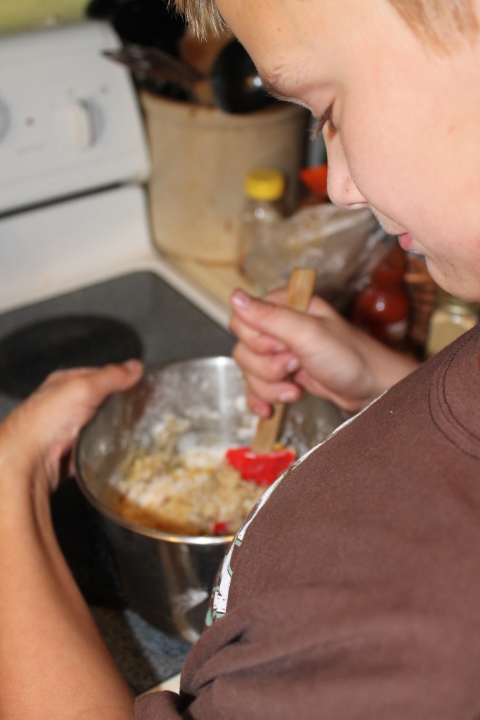 The Wee One and I were baking snickerdoodles right before Thanksgiving. His words were that it smelled like Christmas. His memories of Christmas are going to include the smell of cinnamon. My children are going to remember peanut butter blossoms, snickerdoodles, and Rolo turtles as being part of their holiday season. For more Christmas or holiday baking ideas, please visit my Christmas/holiday page or click on the link. Have a great holiday season from my house to yours!